Home » Blog » Activities » Meeting of the associations of Spanish researchers abroad. Madrid, June 2015. 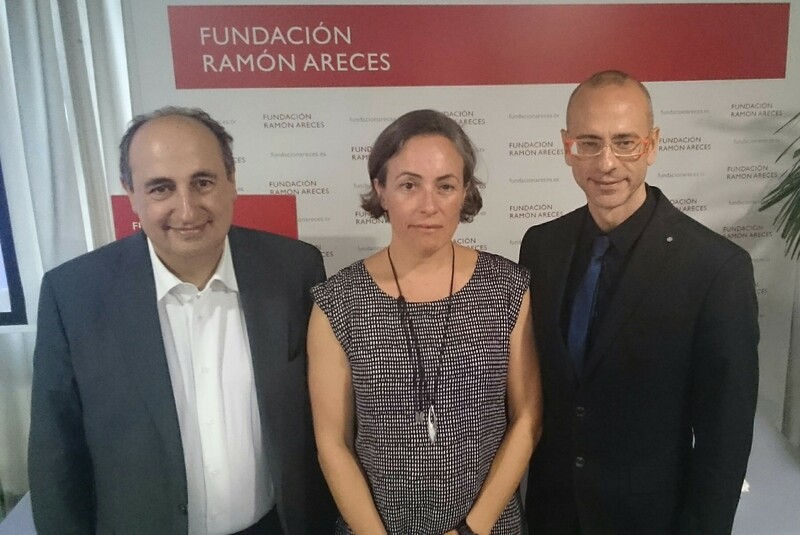 Meeting of the associations of Spanish researchers abroad. Madrid, June 2015. Luis and I attended the meeting of the associations of Spanish researchers abroad. We were invited by the FECYT and it was a long-awaited meeting. These associations include a broad range of researchers whose commonality is that they are Spanish but their science/research belongs to the country that employs them. Our associations include from PhD students to full professors and our objectives can be found here; even though moving back to Spain would be attractive for many of us, opening pathways for moving back to Spain is not one of our objectives. The second day of the meeting included researchers and diplomatic representatives and the Australia-Pacific team now included Cesar Espada who is both a member of SRAP/IEAP and our contact in the Spanish embassy in Canberra. 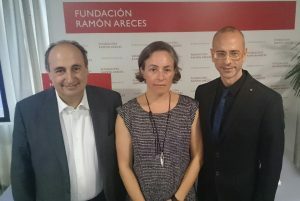 Luis Salvador-Carulla, Ana Vila-Concejo and Cesar Espada during the meeting of the associations of Spanish researchers abroad. Madrid, Fundacion Areces. Juni 2015. The morning of the second day of the meeting was first dedicated to the presentation of the programs that Spain currently has in place to capture foreign talent. There were some examples of success but there was the underlying problem that most of the programs rely on soft money fellowships which have a limited duration. This prevents researchers from establishing their careers in Spain and it also limits their eligibility for applying to funding grants. The great difficulty that foreigners (and we should include us as foreigners here) have to enter the university system in Spain was also discussed but no conclusions were reached. We had a meeting of associations in the afternoon. Each association presented what they were doing in their respective regions and there was a round of discussion with representatives from FECYT and other Science/Research/Innovation representatives from the Spanish government and private foundations. It was inspirational to see how much science and networking is being done all around the world by a bunch of volunteers like us! All the associations got together and worked in a press release in Spanish.